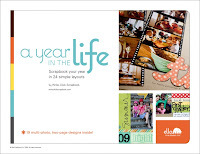 Thanks for all the great comments to the review for A Year in the Life eBook by Write.Click.Scrapbook from Ella Publishing! It was so much fun to read about why each of you love your month of choice. I was a little surprised that no one seems to love the love month...poor February...but every other month seems to have some devoted fans. Not surprisingly, June, the beginning of the summer season, is loved by many. However, the months containing the end-of-year holidays (Halloween, Thanksgiving, Christmas) seem to tower above the rest of the year when considered collectively. This actually gave me an idea for a layout...how about scrapping a family layout that records each member's favorite month of the year and includes journaling in their own words?! Could be fun!! Stay tuned for more great reviews and giveaways coming soon!